I love a good bowl of soup. It warms me from the inside out. 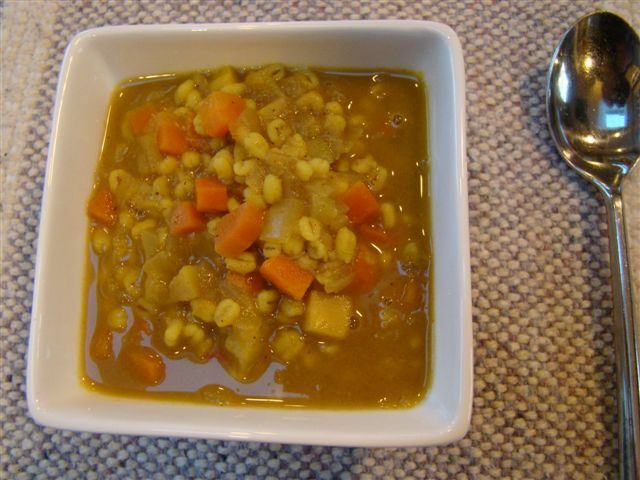 This first week of spring has been particularly cold, so this week’s recipe selection for French Fridays with Dorie, Vegetable Barley Soup with the Taste of Little India, was quite welcome. As the name suggests, this soup is a root vegetable barley soup dressed up with Indian flavors: ginger, garam masala, and turmeric. 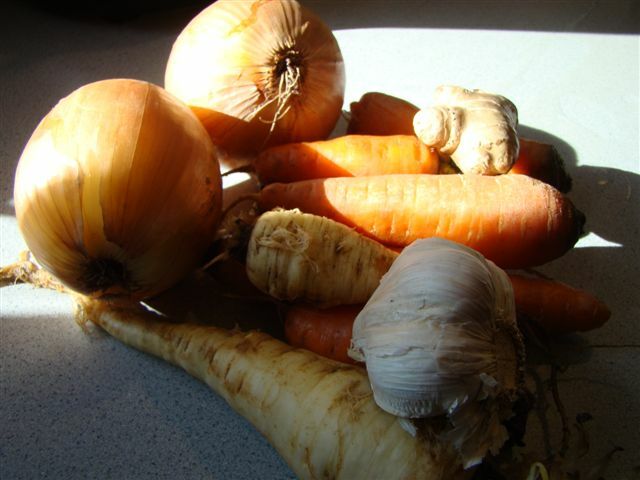 We’re getting to the bottom of the barrel with the winter vegetables stashed in the makeshift root cellar in my basement, but I found carrots and a parsnip in there. The rest of the ingredients are staples in my kitchen. I reduced the chicken stock to one quart, as I usually do with Dorie’s soup recipes. This was very easy to throw together. And fast. 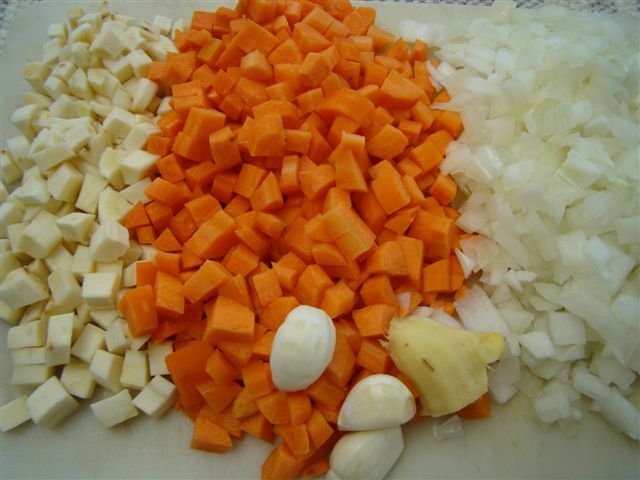 A pot of hearty soup was ready in an hour, from start to finish. However… I would say I’d have preferred the basic version of the soup. I love Indian food, so, in principle, it wasn’t that I don’t like the spices used. I just didn’t love it in the soup. And I did love the vegetable and barley combination. I particularly enjoyed the parsnip. It always adds a unique flavor to any dish. Next time, it’s plain vegetable barley soup for me. On an exciting note, I’m having dinner with Mardi of Eat.Live.Travel.Write. tonight. It’s a mini-Dorista meetup, on a Friday, of course. To see what the other Doristas thought of their Indian-flavored soups, check their links here. The recipe can be found in Bill Daley’s recent article in the Chicago Tribute about French Fridays and other online cooking groups. He interviewed me for the article, so you can also read a few quotes of mine. Of course, the recipe can also be found in Dorie Greenspan’s book Around My French Table. This week’s recipe for French Fridays with Dorie is an elegant and substantial starter. Disks of puff pastry are topped with a mixture of caramelized onions and bacon, then adorned with barely cooked sea scallops. Let’s start with the puff pastry. For whatever reason, I always have the hardest time rolling out thawed puff pastry. The thawed slab never seems to get much bigger. That means that every time I’m faced with a recipe that calls for puff pastry, I get a pit of dread in my stomach. Last month, I came across a recipe for Quick and Easy Puff Pastry on Chocolate & Zucchini. I’ve been looking for an opportunity to try it out since then. Clotllde said this recipe changed her life. Now that I’ve made it myself, I can see why. It was truly easy. The technique wasn’t the laminated style of a true puff pastry, where the butter is rolled into a slab that gets rolled inside the pastry dough. This is more of a rough puff pastry where butter is cut into the flour, staying in relatively large pieces. After that, the fold and roll steps to form layers is similar. No food processor required either. This is a purely manual operation. I cut the butter in with a pastry blender. Then ice water is incorporated with a dough scraper. Finally, a few roll and fold repetitions, one full rotation and then some (I lost count, so did some extras), and that’s all that was needed. I splurged on Plugra, though I’ll have to make it again with my usual butter to compare. The dough remained supple and was very easy to roll out, but in the making, and later when I rolled out for the disks. I’m thinking I’ll never buy puff pastry again. My favorite part of this recipe was the onion and bacon mixture. I sliced my onions thin, though you can also choose to chop them finely. My new trick when caramelizing onions is to cover the pan for the first 10 minutes or so to accelerate the softening of the onions. 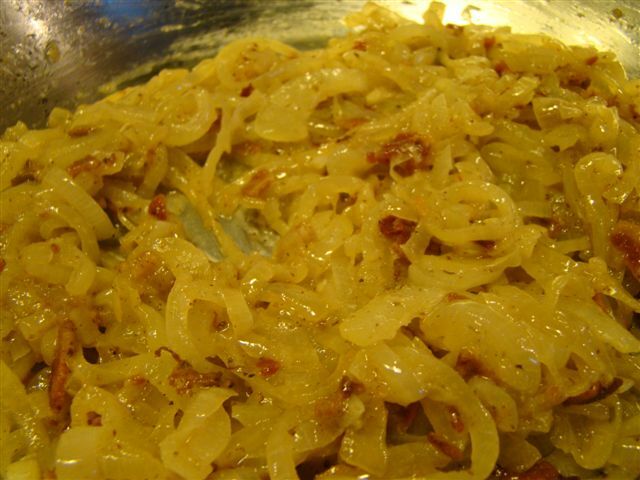 Then, the uncovered onions continue to cook, and brown, and finally caramelize. This combo would be great to fill a full-sized savory tart too. Finally, the scallops. I’ve never seen them as expensive as they were this week. I nearly fell over when I saw them priced at $28.99 a pound. I was only making half the recipe, so I asked for three scallops (they were huge), which ended up weighing just under half a pound for $11. Even though I trust the freshness of Whole Foods seafood counter, I seldom keep uncooked fish in my refrigerator overnight. I’m a “eat it the same day I buy it” seafood shopper. I mixed up some dates this week, so ended up buying the scallops two days before I actually needed them. This made me squeamish about eating them raw (OK, barely cooked). 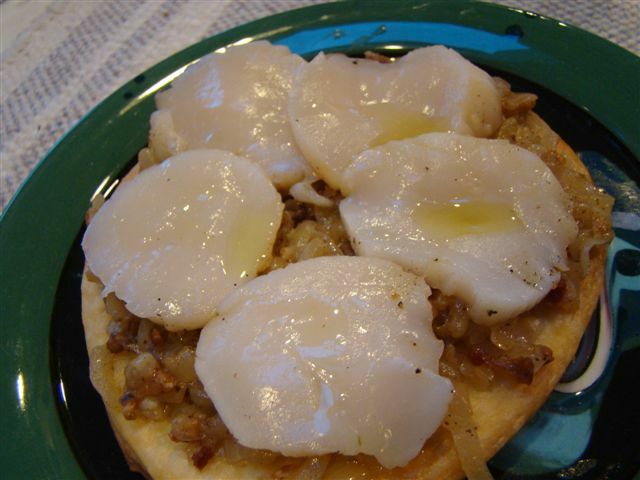 Instead, I seared the scallops the way we have before, then sliced them into disks to top the mini-onion tarts. The final word? We both liked them. We agreed that the onion and bacon topping was so satisfying that we would have liked them just as well without the scallops. Also, Clotilde’s rough puff pastry is a keeper. It tasted fantastic! Even with the expensive European butter, it is still more economical commercial puff pastry. And no dread involved. 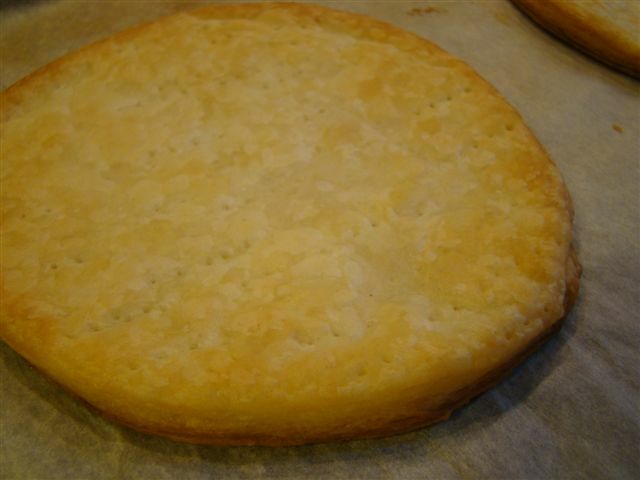 To see how my Dorista friends’ tartes came out, check their links here. We don’t post the recipes, but you can find it in Dorie Greenspan’s book Around My French Table.